A whole new era of AQUAMAN begins as master storyteller Stjepan Sejic (Sunstone, Death Vigil) joins series writer Dan Abnett for Arthur’s boldest and most harrowing adventure yet in AQUAMAN VOL. 4: UNDERWORLD! In a tale that echoes sci-fi and fantasy sagas of the past, this critically acclaimed graphic novel is already being hailed as one of the greatest Aquaman stories ever told. 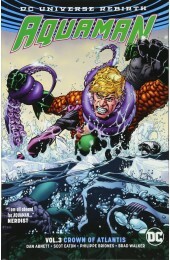 Collects AQUAMAN #25-30.